The middle week of the HITS Chicago Summertime Series wrapped up with Showplace Summertime II featuring over 400 classes throughout the week, including qualifiers for the Marshall & Sterling Insurance League Finals and the HITS Championship, along with several Open Jumper Classics and the $35,000 ULCERGARD Grand Prix which highlighted the schedule on Saturday. Riders are gearing up for another week of Hunter, Jumper, and Equitation competition at HITS Balmoral Park as we jump “hoof-first” into the Showplace Summertime III. The Grand Prix Ring kicked off last Wednesday with the $5,000 Johnson Horse Transportation Open Welcome. Shannon Hicks started her week on a high note, riding home with several of the top five placings, taking the win aboard AL PACHINI in a time of 36.378, followed by respective third and fourth place finishes aboard JAHIL and CLEARWATER 5 in times of 37.144 and 37.278. Taking home the second place ribbon was Isabella Bleu Baxter and CAROQUADOS T in a time of 36.838, and rounding out the top five was Alexis Trosch and CANTARA Z, crossing the timers in 40.684. JAVA VAN DE KLEINHEIDE and UNITED M, in times of 43.566 and 45.720. 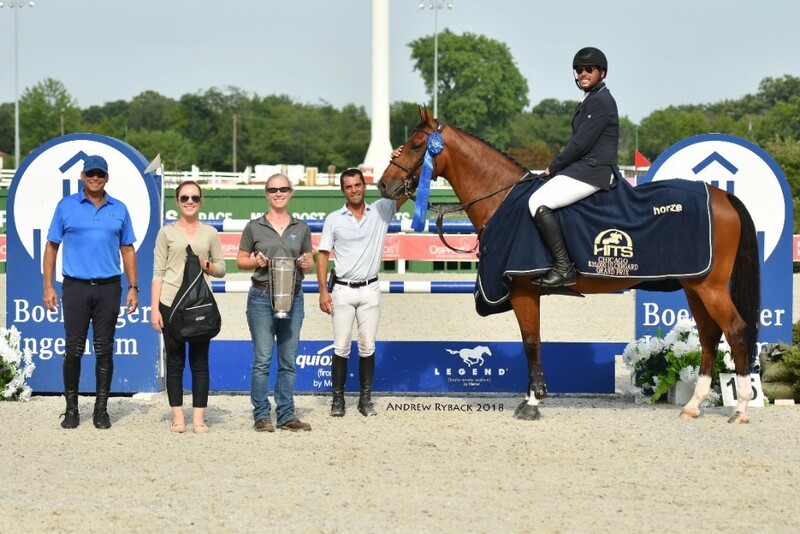 On Saturday, Andrade claimed another first place finish, this time aboard RICORE COURCELLE, in the featured $35,000 ULCERGARD Grand Prix, crossing the timers in an astonishing 39.730. But he didn’t stop there, Andrade also took home the third and fifth place awards with REUS DE LA NUTRIA and HARDROCK Z, respectively, in 41.319 and a four-fault time of 41.286. Trosch followed in second aboard OPALIEN Z in a time of 40.099. Taking home the fourth place honors was Gustavo Prato and CARNA Z in a four-fault time of 39.320. Keely McIntosh and INNE VAN DE PLATAAN claimed the blue ribbon in the $2,500 Summit Joint Performance Jr/A-O/Am 1.35m Jumper Classic. 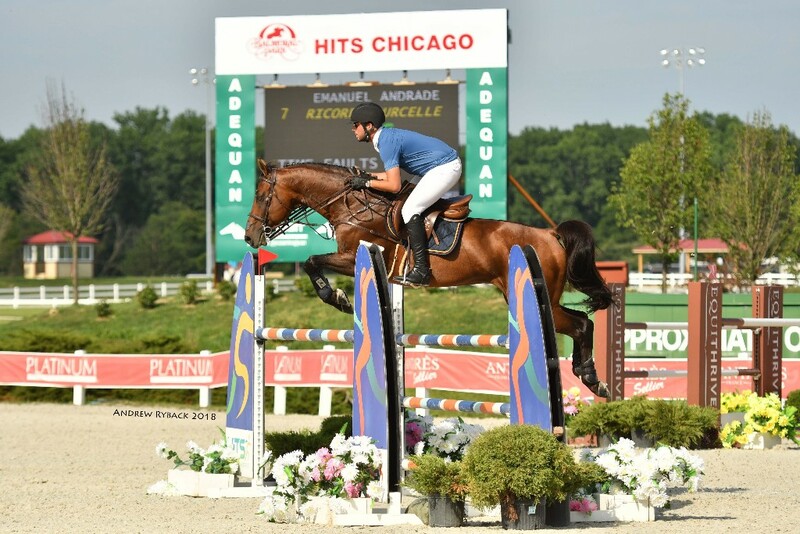 Summit Joint Performance will present a Leading Rider award at the end of the HITS Chicago Series to the rider earning the most points in the Jr/A-O/Am 1.35m Classics throughout the season. 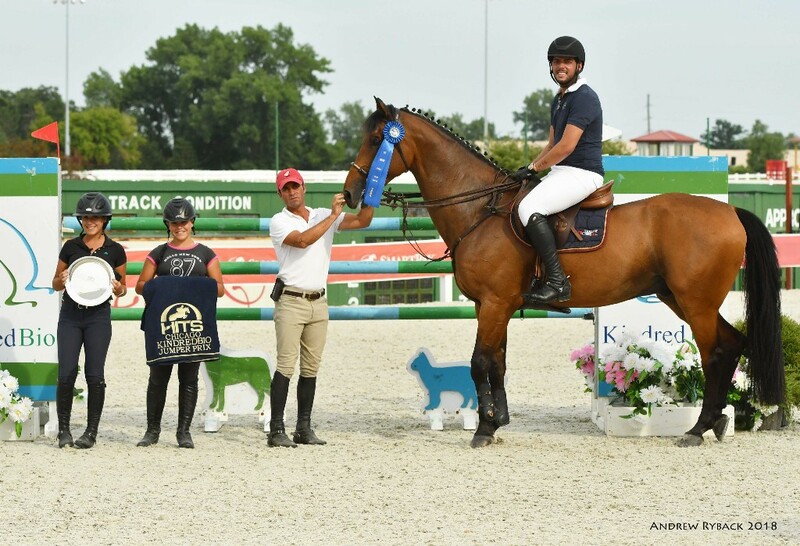 Showplace Summertime II closed with the $5,000 SmartPak Grand Prix on Sunday afternoon, where Andrade would take home four of the five top placings. The mount that carried him to a first place finish was TUPAC VAN DE VROMBAUTSHOEVE Z in a time of 33.645, followed by a ride on BOY IV in second finishing in a time of 34.056, and JENNI’S CHANCE in third crossing the timers in 34.145. 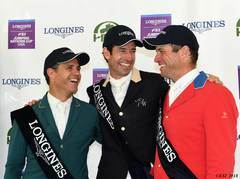 Andrade would also pick up the fifth place ribbon on CORTINA 186, jumping to the top five placing in a time of 35.645. Claiming the fourth place ribbon was Bryn Sadler aboard BRITT W.H. in a time of 34.436. Friday morning, hunter riders challenged the course in the $2,500 USHJA National Hunter Derby. Taking home the win was Laura Linback aboard ATTENTION PLEASE with an overall score of 173. Linback scored an 83 in Round One and a 90 in Round Two. Kim Barone and INDIGO GIRL were awarded second place honors with scores of 84 and 88 for a two round total of 172. Rounding out the top three in the Derby was Johnny Salazar aboard FORTITUDE with a first round score of 81 and a second round score of 83 for a combined total of 164. $2,500 USHJA National Hunter Derby. All results from the Showplace Summertime II are available online. To keep up with the HITS Happenings, visit us online at HitsShows.com or follow us on Facebook, Twitter, and Instagram. Join us this week for the Showplace Summertime III (July 18-22) where riders will compete for more blue ribbons. 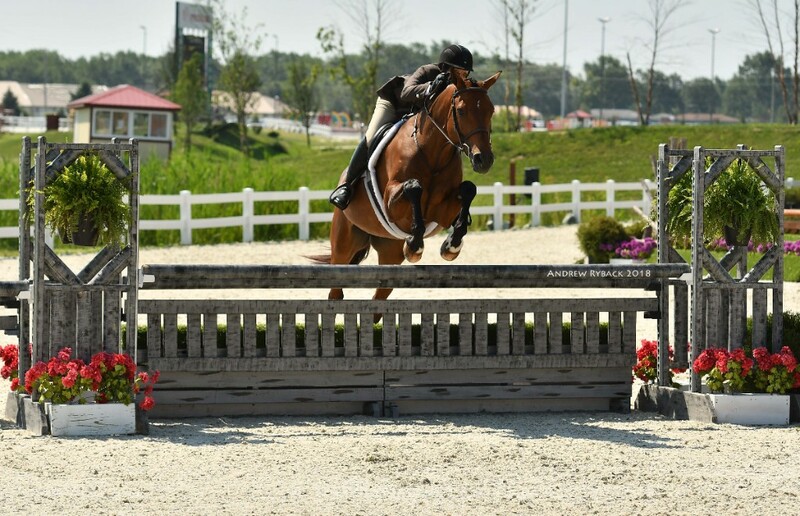 Featured classes include a $10,000 USHJA International Hunter Derby on Saturday and the USHJA Zone 5 & 6 Hunter and Jumper Championships which HITS is hosting for the second year at HITS Balmoral Park. For more information on the show this week or HITS Chicago in general, visit the Chicago Event Page. The complete prize list is available here. There is still time to enter! Check out the Online Entry System, today! Stay up to date with the the HITS Championship Standings online!